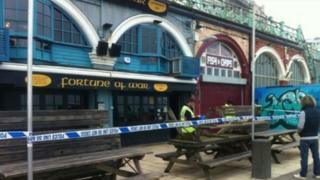 Part of Brighton's seafront has been closed to traffic following a collapse in arches underneath the road. The "large depression" in the A259 King's Road was discovered by men who had been carrying out work at the Fortune of War public house on Friday. Surveyors from Brighton and Hove City Council have been at the scene. The route for the annual nationalist March for England, which will make its way through the centre of Brighton on Sunday, has been slightly amended. Sussex Police have put a cordon in place near the collapsed carriageway and motorists have been urged to avoid the area. A force spokesman said: "It was discovered by workmen engaged in underground building work at the pub, which is near the junction with the A2010 West Street and the UMI hotel." Laurence Hill, landlord of the Fortune of War pub, said builders were shoring up a fire exit when "a couple of tons of rubble" came down. "Now you can pretty much see underneath the road from the inside of the pub... it looks like we are still going to be able to trade, we will just have to close off the back area," he said. Mr Hill added that no-one was injured. Geoff Raw, executive director at Brighton and Hove City Council, described it as a "relatively small, localised collapse". "Although it was triggered by the contractors going in, some of the causes are historic," he said. The eastbound carriageway of the A259 will remain closed for the next few weeks until repairs have been carried out. Mr Raw said traffic diversions were in place and structural engineers would be working over the weekend to assess the extent of the problem. "We're working as swiftly as possible with the police and key partners to ensure public safety and to keep the traffic moving as smoothly as possible," he said.